When Google launched Google Play (originally called Google Music) last year, a lot of hype surrounded the service, since it represented the search giant's entry into the world of music streaming. But now the hype has largely died down, and many Google users remain confused about what the service allows them to do, and how Google’s music locker works. We have the info you need to start uploading and streaming your music with Google Play as efficiently as possible. Google Play’s primary purpose is to let you upload your existing music (up to 20,000 songs as of this writing; sorry, music aficionados) to Google’s servers so that you can store them, stream them, and redownload them to any computer connected to the Web. 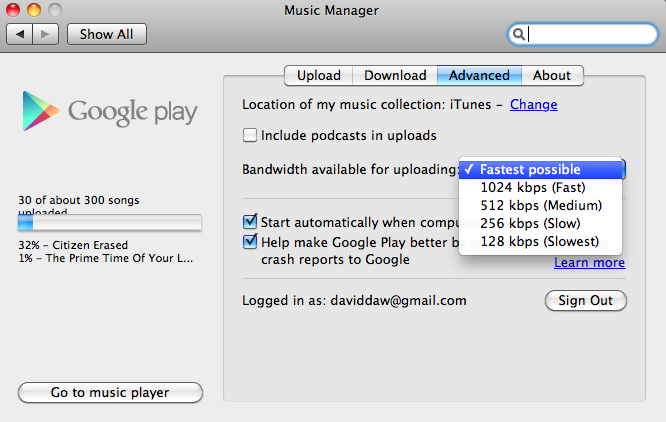 You need to install Google’s Music Manager software, which helps you find and upload your music. 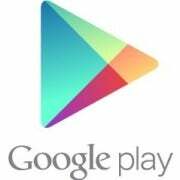 The application is available from the Google Play store; if you haven’t signed up for the Google Play store yet, the Google Play home page will default to a download page for the program. After you download the Music Manager app, install it and configure it for your PC. The setup process is straightforward; after you sign in with your Google email address and password, it will ask you to indicate the main music library on your computer. 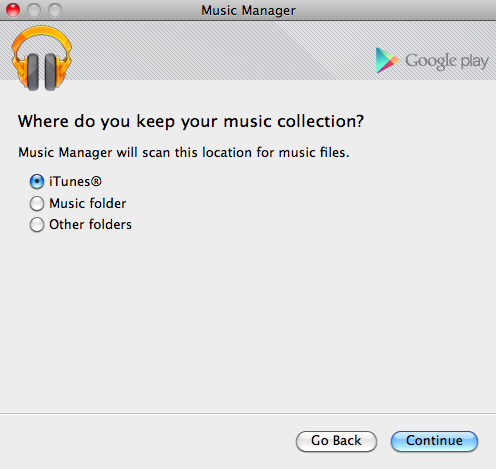 By default the application will zero in on your iTunes music library; if the bulk of your music is located elsewhere, you can point Google in the right direction by selecting that folder manually. 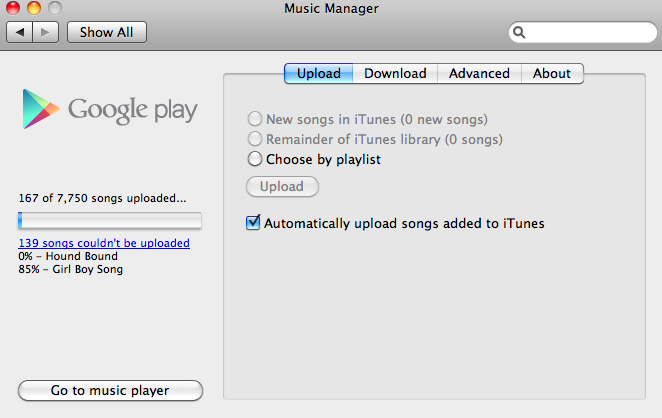 The Music Manager will scan the selected folder and begin preparing all compatible tracks for upload. The application will also add iTunes playlists, music ratings, and play counts to the Google Play library, further easing the transition from iTunes. The main drawback to Google Play is that the uploading is slow. In my tests, uploading my library of 7000 or so songs took the better part of two days. Luckily, Google Play makes the process mostly painless by keeping the upload client running in the background and turning it off automatically when you shut down or restart your computer. This kind of background uploading can hamper your PC's online performance, but in my tests it didn’t consume too much bandwidth; while uploading music, I was still able to watch streaming video or perform other bandwidth-heavy tasks with relative ease. If you do need to throttle the Music Manager's upload speed, use the 'Bandwidth available for uploading' option under the Advanced section of the application's preferences menu. Google Play can be finicky about file formats, too. Unlike the situation with Spotify, which tries to match unsupported tracks with songs from its library, any DRM-protected tracks you might have bought from the iTunes Music Store or other similar services likely won’t make the jump to Google’s servers. The music that you do upload to Google Play is available pretty much anywhere, as long as you use Google Play's (admittedly simple and well-designed) music player. The Music Manager tries to assess your favorite tracks intelligently by analyzing their rating and play-count information if those details are available (it counts iTunes ratings, for instance, but it doesn't yet support some less-popular music players), and it uploads those tracks first. The result is that your favorite 10 to 15 albums should be available in the first hour or so after you start uploading, assuming a stable broadband connection. 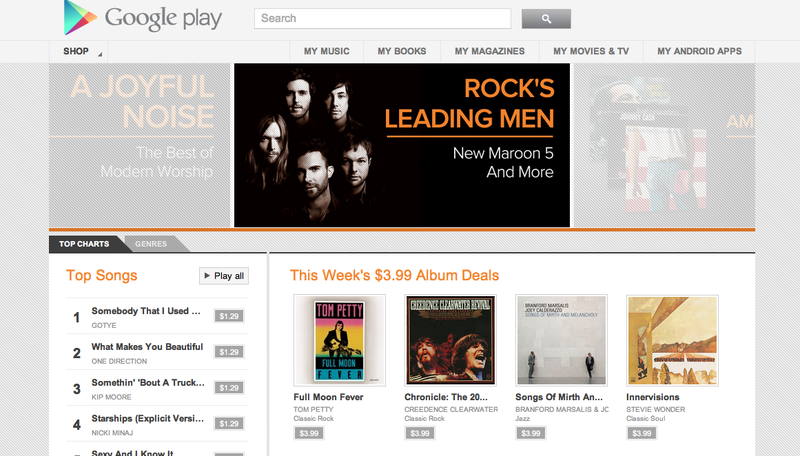 Log in to your Google account, and point your browser to the Google Play Web Player. Users of Windows Media Player, iTunes, or similar music players should be familiar with the Web Player layout: You can access playlists, albums, or artists using the navigation bar on the left, and you can choose a specific track to play from your music library on the right. Of course, this is a Google product, so the player also has a search bar near the top of the page for finding a particular uploaded album or track. A few convenient keyboard shortcuts in the Web Player can make your life a little easier. The usual keyboard shortcuts are here--pressing the spacebar pauses or plays the current track, for example, and tapping the arrow keys lets you advance and rewind through tracks. In addition, you'll find some Google-specific keyboard shortcuts: For instance, press the I key for an algorithmically generated playlist based on the current track, or press the / (slash) key to jump to the search box and find your favorite tracks. Of course, Google would prefer that you buy tunes from the Google Play music store, so Google Play is designed to work best with those purchased tracks. That said, songs bought from the Google store come as high-quality DRM-free MP3 files, and they cost about as much as songs from the iTunes store. In fact, the two content stores are similar enough that you have no truly compelling reason to choose one over the other. Google lacks some songs that iTunes has (Google has yet to sign a deal with Warner Music, for example). However, when you purchase music from Google, the tracks appear in your Google Play library automatically, an intriguing feature if you want to make Google your primary music player. Android phone and tablet users can get the most out of Google’s music service, thanks to the Google Play Android app. 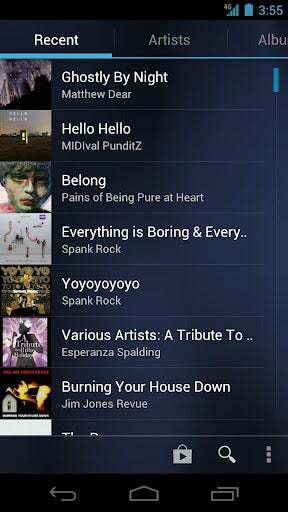 In addition to letting you stream music from your mobile device, the app allows you to store any playlist for playing offline, a handy feature to have when a Wi-Fi or cellular connection isn’t available. iOS users desperate for a Google Play fix can still access the Web Player through any browser (including Safari); of course, Apple users have no way to use offline mode without a dedicated Google Play app. Now that I've shown you what Google Play is and how it works, I have to note a few things. If you are a hard-core music fan, Google Play is not an ideal fit for you unless you are deeply tied to the Android ecosystem. In contrast, if you are a casual user of Google’s Web services, you'll find Play useful as a way to back up your favorite tracks so that you can enjoy them from any Internet-connected computer in case you lose access to your home library or suffer a catastrophic data loss that wipes out your music collection.